The explanation of Sri Brahma Gayatri, the mother of all Vedas, signifying devotional worship unto Srimati Radharani (radhanudhyana-para) explanation which was revealed in the depth of realization of Pujyapada Sridhara Deva Gosvami Maharaja, possessed with the divine grace of paramaradhya Sri Srila Prabhupada upon his head, is deeply appreciated by those fortunate intelligent devotees who are aware of the relishable beauty of pure devotional service. 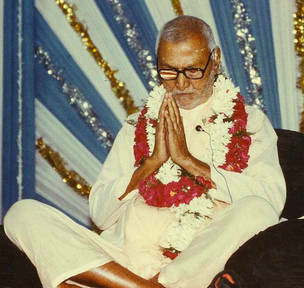 The Srimad Bhagavatam, which is revealed in the transcendental meditation of Sri Veda-Vyasa, is the quintessential scripture of all the Vedas, Vedanta, Puranas and Pancaratras. Vrajendra-nandana Vrndavana-candra Sri Krsna has alone been manifested therein as the Supreme Worshipable non-dual object (the Supreme Personality of Godhead- the summum-bonum of our lives). Srila Raghunatha Dasa Gosvamipada did not like to accept Lord Krsna merely as bakari (the slayer of Bakasura and other demons) nor the idea of residing in Sri-dhama Vraja without the grace of Srimati Radha Thakurani. One cannot live in Her domain or have the fortune of darsana of the original transcendental form of Sri Vrndavana-vihari Sri Krsna without the grace and sanction of His svarupa-sakti Srimati Radha-Thakurani. "The hladini sakti, Srimati Radharani, is always engaging Krsna, Her Divine Lord, in tasting and profoundly relishing the Divine Pleasures and infinite Divine Ecstasies, and it is through that hladini-sakti that Lord Krsna maintains and sustains the devotional life of His devotees". "Srimati Radhika is the svarupa-sakti of Lord Krsna and is known as hladini because She always keeps Him merged in the ocean of Supreme Ecstasy. In addition She is also defined as the supreme maintainer and sustainer of divine devotional life, the Supreme Promoter of krsna-prema within the original selves of all jiva souls, who are the eternal parts and particles of the infinite transcendental potency of Lord Sri Krsna." "The potency by which the Supreme Lord maintains and sustains the entire entity, the existence of all, is called sandhini-sakti, the revealer of time, place, things and circumstances. That potency by which He Himself can know and make others know is called samvit-sakti or jnana-sakti. That Supreme Consciousness Potency of the Lord by which Srimati Radharani can directly know of the anandam (the Lord, Reality the Beautiful) and most graciously allow others to know feel and taste the same anandam is called hladini sakti. That original Supreme Ecstasy Potency, namely Sri Hladini, is always engaged in giving pleasure to Her dear Lord Krsna, the dear most son of the King of Vraja an the full moon of Vrndavana-dhama. Therefore, essentially, we must do all our devotional duties, services and worship with the acceptance of unconditional surrender at the Lotus Feet of Sri Vrsabhanu Radha-nandini, the dear-most daughter of the King Vrsabhanu and the Crown Jewel of all the Vraja-devis. Hence, abhideya means the profound thinking, feeling and absorption in all respects upon the Supreme Lord and through that process of meditation and absorption the attainment of that plane of pure devotional consciousness prayojana or premavasta- the lofty storage of Divine Love". 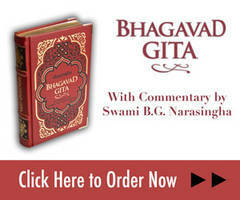 Therefore this pure devotional meditation upon Sri Radharani is the topmost confidential meaning of Sri Brahma Gayatri. The commentary upon Sri Gayatri revealed by pujyapada Sridhara Maharaja was published from Sri Caitanya Sarasvata Matha on 12 Karttika 1395 (30th October 1983) in the Vyasa Puja issue in an article entitled Sri Gayatri-Nigudhartha (The Profound Definition of Sri Gayatri). This commentary has been elaborately explained and I am bereft of the proper language to elucidate the profound meaning of Sri Gayatri as revealed by pujyapada Maharaja, which is that sublime radha-dasya or radha-pada-dhyana - the exclusive devotional servitude to Srimati Radharani. Therefore it can only be presented and understood through his own illustrious transcendental language and by his exclusive divine grace. This deepest meaning of Sri Gayatri has been nobly established by every aspect of the message emanating from his lotus lips and by the exultant mood radiating from the core of his heart. Without submission to the lotus feet of pujapada Sridhara Deva Gosvami Maharaja, whom Srila Prabhupada Bhaktisiddhanta Saraswati Thakura has directly absorbed in the divine rupanuga flow, we cannot have access to that confidential realm. To see such a high appreciation of Srila Sridhara Maharaja really captured my heart. Other things were also said in that article that I did not read, as I did not want to make this talk too lengthy, but Srila Puri Maharaja's deep appreciation of Srila Sridhara Maharaja definitely captured my heart. Of course, I must also consider my Guru Maharaja, Srila Bhaktivedanta Svami Prabhupada. Certainly anyone whom I approach must have a favorable attitude towards Prabhupada in order for me to seek their holy association. But very often that is more of a general thing - a more general conception. Yet very specifically, those who have a deep appreciation for Srila Sridhara Maharaja capture me. And after that, my experience shows me that any such person will also have a deep appreciation for all Vaisnavas. Once I commented to someone that, "Srila Sridhara Maharaja seems to have a capacity of speaking where he can put so much meaning into so few words." At that time one of his disciples who had been with him for many years said, "Yes. Bhakti Dayita Madhava Maharaja used to say that, 'Every word of Srila Sridhara Maharaja is a sutra. He has packed so much meaning in each and every of the few words that he has given.'" So, not only are we very fallen souls charmed and attracted by his words, but even his own godbrothers who are themselves very advanced devotees and servitors of Srila Bhaktisiddhanta, have given heartfelt recognition to the depth of Srila Sridhara Maharaja. To quote another instance, I was once informed that Madhava Maharaja told, "If Sridhara Maharaja is reading the newspaper that is the same as his studying the Vedas." In my asrama, if I see you reading the newspaper, I will say, "Why are you wasting your time reading the newspaper?" This type of comment Madhava Maharaja gave -even his reading the newspaper is as good as his studying the Vedas. What is to be known by studying the Vedas? Ultimately it is Krsna, and one who has awakened his pure love of God, will see Krsna everywhere, even in the newspaper. But without the depth of vision, we will only see the maya. We will not see the transcendental reality beyond that. Again, Srila Sridhara Maharaja had a very penetrating vision of reality and once he said, "The cinema music in Navadvipa is superior to the kirtana that is going on around the world." I had a hard time adjusting to understand such a profound statement, "What is this? The cinema music?" I always complain about the cinema music - of Navadvipa especially. So how is that? But his vision of the dhama did not have any mundanity attached to it. He had a pure transcendental vision of the dhama and whatever comes out of the dhama has got profound divinity behind that. We are trying to reach that holy dhama through sankirtana, preaching and doing so many things all over the world. But he saw that it is present here, living always - the divine conception - even in the apparently mundane, he could perceive it. During the time when I visited Caitanya Sarasvata Matha, I wanted to go and get Ganges water to put in a bottle to bring for the devotees in Hawaii. Someone then told me that Srila Sridhara Maharaja had said that the water in the matha's well was superior to the Ganga. Again, this was like a thunderbolt upon my head. Two or three times I have been to Gangotri and worshipped Mother Ganga in different places. How is it possible that this well was superior to Mother Ganga? That devotee then explained, "No, Guru Maharaja said that the Ganga comes from outside and it comes through Navadvipa-dhama. But the water in the well has originated from the dhama itself." These were some (as we say in English) 'wake-up calls.' This was how Srila Guru Maharaja always perceived things. He saw how profoundly transcendental and spiritual the dhama really is. Maybe he saw the tendency in us to only see the external, mundane features of the dhama - the chaos, the dirtiness, the noise etc. But he was always very deep - not superficial. In every issue he always gave a depth of understanding. In relation to the Gayatri-bhasya, some people have said that 'it is written in many places', but these ears of mine don't know any language other than English, so I cannot say that I have found the meaning of Sri Gayatri in many places. I have only heard it through the transcendental wisdom of Srila Sridhara Deva Gosvami Maharaja as it came in the English language. Although it is said Jiva Gosvami has written a commentary to the Gayatri, Sridhara Deva Gosvami himself said that he had never seen it. He could not find it so he wrote a commentary himself and this has been acknowledged. Since the day of Brahma, everybody chants the Brahma Gayatri -from general Hindus to the Ramanujas, Madhvas and Sankarites. But through the Brahma Gayatri commentary of Sridhara Maharaja, the illustrious conception of Mahaprabhu and His camp stands above all. It is not an ordinary thing. It is not a thing of scholarship or word jugglery. As Srila Puri Maharaja has said, it is a 'heart realization'. So, wherever I find appreciation for the depth of Srila Sridhara Maharaja's realizations, I am ready to be a slave to that, under any circumstance. I will break the rule of trust and tell something which Srila Sarasvati Thakura once said in regard to his own inner conception -"In my divine vision of service I have seen that Svarupa-damodara and Haridasa Thakura have reappeared as Bhaktivinoda Thakura and Gaura-kisora Dasa Babaji. But don't make this public, people will laugh at me and think that I am a madman." Mahaprabhu also told Ramananda Raya, "Don't tell these things to others. They will simply consider us mad." But he said, "I have seen with my divine service eye." In all regards Srila Sridhara Deva Gosvami Maharaja, from beginning to end, is an exalted servitor of Sriman Mahaprabhu and His divine disciplic succession and of His Divine Grace Bhaktisiddhanta Saraswati Thakura. Whatever few words we can speak in glorification of him will raise us up from the filth of this material existence and gradually take us to the lotus feet of Krsna. It is the speediest vehicle. Of course, we may also glorify other Vaisnavas, but on this day we are particularly trying to remember the glorification of Srila Sridhara Maharaja in some humble way. It is also my personal opinion that if a day passes and I fail to speak something in glorification of Srila Sridhara Maharaja and our other Divine Masters and Guardians, then that day has been a waste -despite having chanted 32 or 64 rounds and performed wonderful pujas and abhisekas. If a day passes without glorification of the Vaisnavas, the exalted eternal servitors of our Supreme Lord, then that day is a total waste. Srila Bhakti Raksaka Sridhara Deva Gosvami Maharaja ki jaya!